Date of Birth : 12th July, 1979 Deoria (U.P) India. 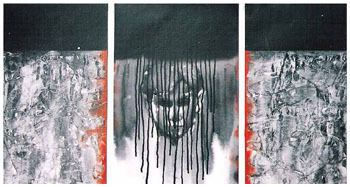 2005 Best Painting Award, Kala Mahotsava, M.M.K. College of Visual Art Gulbarga. 2005 “All India Art Exhibition” Organized by Tilak Smarak Trust, Pune (MS). 2001 Kala Mela, M.M.K. College of Visual Art, Gulbarga. 2001 Best Student Award, M.M.K. College of Visual Art, Gulbarga. 2001 Youth Festival Award in Painting, Gulbarga University, Gulbarga. 2006 “Shadows of Tripura” Landscape Painting, Agartala (North East). 2005 “Vaishwik Art Gallery”, Pune. 2005 “Sreejani” Art Exhibition held at Bangalore, Sponsored by K.C.Das Pvt. Ltd.
2005 “Chitra Santhe” held at Karnataka Chitrakala Parishath, Bangalore. 2005 “Splash of Colour “Exhibition Chaitanyamayi Art gallery-Gulbarga, Sponsored by Indian Royal Academy of Art and Culture, Shahabad. 2004,03,02,01 M.M.K. College of Visual Art, Gulbarga. 2004 5th Camlin Southern Region Art Exhibition, Bangalore. 2004 All India Art Exhibition Royal Academy, Shahabad, Dist: Gulbarga. 2004 Silver Jubilee, Gulbarga University, Gulbarga. 2004 47th National Exhibition of Art, Lalit Kala Academy, New Delhi. 2003 Nimondige Navu, Painting Exhibition Art, Humnabad, Sponsored by Karnataka Lalit Kala Academy Bangalore. 2003 4th Camlin Southern Region Art Exhibition, Bangalore. 2002 3rd Camlin Southern Region Art Exhibition, Bangalore. 2001 Mumbai Art Society, Mumbai.